Ce document au format PDF 1.7 a été généré par Elsevier / Acrobat Distiller 9.0.0 (Windows), et a été envoyé sur fichier-pdf.fr le 09/05/2017 à 11:44, depuis l'adresse IP 86.192.x.x. La présente page de téléchargement du fichier a été vue 244 fois. Taille du document: 1.1 Mo (13 pages). the new, drawing from existing knowledge. Method. – Data was analysed with EVOC 2000 and SIMI 2000 software. Results. 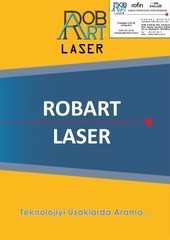 – The social representation of robot is organized around the ideas of technology, help and future. Differences in the representation according to age, gender and level of education where also identiﬁed. with the concept of social robots as social agents. Implications for social robot’s acceptance are discussed. but d’identiﬁer la représentation sociale du robot. Méthode. – Les données ont été traitées à l’aide des programmes EVOC 2000 et SIMI 2000.
l’acceptation des robots sociaux sont discutées. Algarve, Campus de Gambelas, 8005-139 Faro, Portugal. 1162-9088/© 2016 Elsevier Masson SAS. All rights reserved. brought forward by recent developments in the area of robotics. and communicating in ways similar to humans, i.e. social robots. detainees and thus reducing the workload of the human guards. against which people will make sense of social robots. (Chao &amp; Kozlowski, 1986; Shenkar, 1988). are a discontinuous innovation (Bagozzi &amp; Lee, 1999). As Young et al. challenges introduced by the use of a robotic solution). but also of those who resist novelty. innovation, several models and sets of factors have been proposed. innovation acceptance. Functional barriers, like use, value and risk. generators of uncertainty and anxiety. brief sketch of the results of this research. robot, to a more autonomous one (Oestreicher &amp; Eklundh, 2006). humanoid robots and found differences for gender and age group. Female participants rated robots higher on familiarity than male. in the middle-age group rated utility of humanoids as higher. provide a brief sketch of the theory. creating expectations, needs and anticipations” (Abric, 1996, p. 78). norms. It is consensual and collectively shared by a social group. way independent from the immediate social context (Abric, 1993). the organization of values, attitudes and actions (Abric, 2003). apparently incongruent character, at once stable and ﬂuid, consensual but marked by inter-individual differences. Socio-demographic characteristics of the participants in study 1.
in newspapers and magazines, and an inconsistent use of condoms. had frequent contact with the social object). Salès-Wuillemin et al. representation of pain, which lead to differential social expressions. education center in the district of Faro. Table 1 shows the sociodemographic characteristics of the participants. could stop to respond whenever they wanted if they felt uncomfortable with the task. would be used in order to represent each of the ideas. Minimum frequency and mean frequency in bold. of other methods see Moliner &amp; Guimelli, 2015). 26 times in the lexicon). frequency and order of evocation. order of the ideas recalled (evocation readiness). easily evoked ideas (order = 2.4), automatic may not be a very consensual idea given its evocation frequency (19). In brief, the word robot evokes an idea of a machine that performs by itself, that is, automatic. The four-quadrant diagram representing frequency and order of evocation. used to build it, capabilities, usefulness and socio-economic impact. from artiﬁcial intelligence, electronics, programming and computers. The work of science and innovation. An evolution, the future. Something that will help, facilitate chores and replace men in some tasks. evokes images somewhat related to the industrial age like mechanization, metal and mechanical. in technology towards the humanization of interfaces. robot machine present in the ﬁrst quadrant. hard tasks, providing an evolution relative to prior technologies. (e.g. robotics, electrical, artiﬁcial, autonomous), its social impact (e.g. cases of more general ideas or concepts. replaces men, unemployment) and time of deployment (future). replaces men, evolution) vs. the disruptive machine (e.g. unemployment). social interfaces and social robots. meaning emerges from these relations (Rouquette &amp; Rateau, 1998). edges that indicate the degree of connection between these words. view the social representation’s structure. robot portrays it as a technology, which can help humans. Also signiﬁcant is the strong relation between facilitates and replaces men. The second organizational node of the tree is the idea of future. frequency). The analysis used the same 25 categories as above. noteworthy is the strong relation between future and replaces men. views of robot, the domestic robot and the puppet. Fig. 1. Tree with the elements of the social representation of robot. Fig. 2. Elements of the social representation of robot by female participants. traditional gender roles, patriarchal norms and family dynamics. Fig. 3. Elements of the social representation of robot by male participants. Fig. 4. Elements of the social representation of robot by participants bellow 32 years of age. social representation of robots is associated to the classical patriarchal dichotomies in terms of economic roles (male breadwinner vs.
technology (see Fig. 4). Noteworthy is the diversity of ideas connected to technology, ranging from artiﬁcial intelligence to movies. robot is organized around the nodes of help and future (see Fig. 5). apart from those of real life. lives. Also noteworthy is the idea that robots are without feelings. Fig. 5. Elements of the social representation of robot by participants above 32 years of age. Fig. 6. Elements of the social representation of robot by participants up to 12 years of schooling. Fig. 7. Elements of the social representation of robot by participants with university degree. with the idea of machine losing the centrality previously identiﬁed. an evolution of electronics that will take the form of industrial robots. robots are viewed as competent but emotionless machines. description of these differences follows. also show some concern with unemployment. a different level organizational complexity. more relevant for their social contexts. The results presented above are in line with previous research. loads machines, increases productivity or reduces manual work. little seems to have changed in the way people perceive robots. of robot. Indeed, elements pertaining to diverse technologies (e.g. them – with their chores, with childcare.” (Livingstone, 1992, p. 5). want social robots to be used for childcare or companionship. underlines the need for further studies in this area. sense of what is the meaning of work, help and replacement. [Methods for studying social representations] (pp. 59–80). Ramonville SaintAgne: Erès. workers react to a robot. Sloan Management Review, 24(3), 31–41. Cesta, A., Cortellessa, G., Giuliani, M., Pecora, F., Scopelliti, M., &amp; Tiberio, L.
elderly. PsychNology Journal, 5(3), 229–252 (Retrieved from http://psychnology. robotic manufacturing technology. Journal of Applied Psychology, 71(1), 70–76. Dautenhahn, K., Woods, S., Kaouri, C., Walters, M., Koay, K., &amp; Werry, I. International conference on intelligent robots and systems (pp. 1192–1197). Fong, T., Nourbakhsh, I., &amp; Dautenhahn, K. (2003). A survey of socially interactive robots. 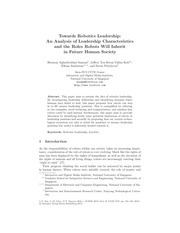 Robotics and Autonomous Systems, 42(3–4), 143–166. http://dx.doi. Towards a method. European Journal of Social Psychology, 23(5), 555–559. Hegel, F., Muhl, C., Wrede, B., Hielscher-Fastabend, M., &amp; Sagerer, G. (2009). representation: Phenomena, concept and theory]. In S. Moscovici (Ed. ), Psychologie sociale (pp. 357–378). Paris: PUF. International conference on intelligent robots and systems (pp. 2452–2459). de questionnaires et de données numériques SIMI2000 (manuel. Kamide, H., Kawabe, K., Shigemi, S., &amp; Arai, T. (2013). Development of a psychological scale for general impressions of humanoid. Advanced Robotics, 27(1), 3–17. innovation and its antecedents. Journal of Economic Psychology, 30(3), 344–357. Lee, M., Forlizzi, J., Rybski, P., Crabbe, F., Chung, W., Finkle, J., et al. (2009). The snackbot: Documenting the design of a robot for long-term human–robot interaction. In 4th ACM/IEEE International conference on human–robot interaction (HRI) (pp. Moliner, P., &amp; Guimelli, C. (2015). (Social representations) Les représentation sociales. Grenoble: Presses universitaires de Grenoble. Morritt, H. (1997). Women and computer based technologies: A feminist perspective. Maryland, USA: University Press of America, Inc.
image et son public. Paris: Presses Universitaires de France. technologies. Cambridge/MA, London: The MIT Press. Ram, S., &amp; Sheth, J. (1989). Consumer resistance to innovations: The marketing problem and its solutions. Journal of Consumer Marketing, 6(2), 5–14. Ray, C., Mondada, F., &amp; Siegwart, R. (2008). What do people expect from robots? In IROS’08, International conference on intelligent robots and systems (pp. change, product form design, and perceptions of value for product innovations. Rogers. (1983). Diffusion of innovations (3rd edition). New York: Free Press. Salès-Wuillemin, E., Morlot, R., Fontaine, A., Pullin, W., Galand, C., Talon, D., et al. training to practice. Revue européenne de psychologie appliquée, 61(1), 51–63. Scopelliti, M., Giuliani, M., &amp; Fornara, F. (2005). Robots in a domestic setting: A psychological approach. Universal Access in the Information Society, 4(2), 146–155. ACM/IEEE International conference on human robot interaction (pp. 25–32). Turkle, S. (1988). Computational reticence: Why women fear the intimate machine. Americas Conference on Information Systems. évocations EVOC2000 (Manuel). Aix-en-Provence: Université Aix-en-Provence. Young, J., Sung, J., Voida, A., Sharlin, E., Igarashi, T., Christensen, H., et al. interaction experience. International Journal of Social Robotics, 3, 53–67. Ce fichier a été mis en ligne par un utilisateur du site. Identifiant unique du document: 00510842.